According to the Spanish animal protection agency Prado, when in the plaza trying to avoid death, this bull recognized the man who was his breeder and caretaker. They say the frightened animal approached the man looking for protection, but instead received a kiss that sealed his fate (referred to as the “Kiss of Judas”). 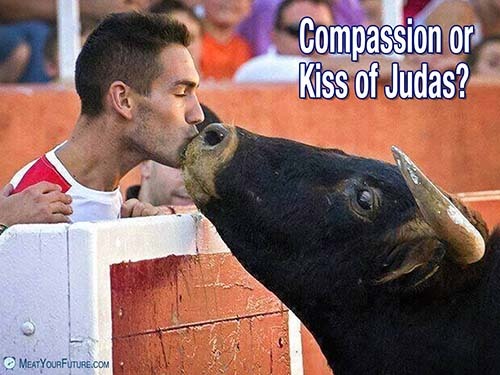 However, this story has not been robustly documented in mainstream sources, and others have shared this image saying the man was an animal activist kissing the bull in a fleeting moment of compassion before his death. Which version is true? Hopefully, the latter that doesn’t convey a cynical betrayal. But with either version, we think this image is powerful, as it conveys helplessness, desperation, pleading, terror and not wanting to die. Animals who are exploited for food, leather or otherwise fight desperately for their lives, just like any of us would. Why not make simple choices in our daily lives that don’t result in paying for the killing of animals who don’t want to suffer and die? Why wouldn’t we, since we can live happy and healthy lives without consuming any animal products? Please go vegan.